Edgar Wallace first introduced his detective Mr J. G. Reeder to the world in his 1924 novel Room 13. Although Mr Reeder played a subsidiary role in the novel the character’s potential was obvious to Wallace and in 1925 he penned a short story collection, The Mind of Mr J. G. Reeder, in which this unlikely sleuth would take centre stage. Mr J. G. Reeder works for the Public Prosecutor. He is a quietly spoken middle-aged man who dresses in a very old-fashioned manner and sports even more old-fashioned whiskers. He is to all outward appearances a harmless and slightly pathetic nonentity. Many members of the criminal fraternity have made the error of taking these outward appearances at face value; all have paid heavily for their mistake. As a Scotland Yard inspector remarks in one of the stories Mr Reeder may look like a frightened rabbit but in reality the animal he most closely resembles is the deadly green mamba. One bite and you’re dead in two seconds. In his early career Mr Reeder had specialised in the detection of bank robbers and forgers, and more particularly counterfeiters. His appointment to the Public Prosecutor’s office offers him the opportunity to come to grips with a much wider sample of the criminal classes. Mr Reeder considers himself to have a criminal brain. He know what a criminal is likely to do before the criminal himself is aware of it, and he knows all their weaknesses and the best ways of exploiting them. The eight short stories in this collection deal with a disappearance at sea that is less innocent than it appears to be, with a Hindu criminal mastermind, counterfeiters, dissipated members of the nobility, embezzlers, a fraudulent scheme for finding sunken treasure and an assortment of gangsters. There are frequent murders, more often than not carried out by unusual and exotic means. In the 1920s Edgar Wallace (1875-1932) was the reigning king of the thriller writers. His output was staggeringly vast and his sales were, by the standards of the day, astronomical. 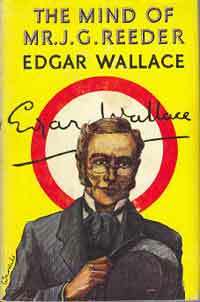 At one point it was estimated that one in every four books sold in Britain was authored by Edgar Wallace. He was execrated by the critics but he took no heed of such minor annoyances and his books just kept on selling. While most of Wallace’s books were out-and-out thrillers, this being the genre that brought him his greatest fame, The Mind of Mr J. G. Reeder sees him turning his hand to the detective story, with considerable success. His plots are outrageous but cunningly contrived and there is not a single weak story in this collection. Mr J. G. Reeder is a delightful creation. Despite his mild-mannered appearance he is one of the most intriguing of all fictional detectives. Wallace followed up the success of this collection with two more novels and another short story collection featuring this oddest of sleuths. The character would appear in several movies and in an excellent late 1960s television adaptation of The Mind of Mr J. G. Reeder. Wordsworth have published two of the Mr Reeder novels, Room 13 and Terror Keep, along with the first Mr Reeder short story collection in a volume entitled The Casefiles of Mr J. G. Reeder. This volume represents outstanding value for money. The Mind of Mr J. G. Reeder is magnificent entertainment from a master story teller and I recommend it very highly indeed. Richard Keverne is one of those writers who, quite successful in their own day, are now entirely forgotten. His real name was Clifford Hosken (1882-1950) and he wrote books under that name as well as under the name Richard Keverne. After military service in the First World War he worked as a schoolteacher and journalist and that is the sum total of the information I have on him. Keverne was known as a writer of thrillers although it appears that he wrote detective stories as well, although that is merely a surmise on my part based on the fact that the heroes of at least some of his books were policemen, Inspector Mace and Inspector Artifex. 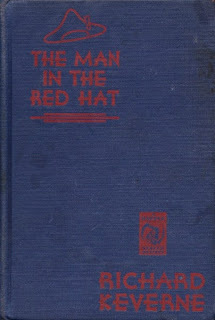 The Man in the Red Hat was published in 1930. A wine merchant named Mark Wickham meets a man named Fanshawe, quite by accident. Fanshawe is about to set off for Asiatic Turkey, apparently in quest of ancient manuscripts. Their conversation turning to painting Fanshawe happens to mention that an elderly aunt of his, a Miss Buckingham, owns a Gainsborough that as far as he knows has not been seen by anyone apart from his aunt for many years. Wickham is extremely fond of 18th century English paintings and expresses a desire to see this picture on the off-chance that it might really be a hitherto unknown work by that renowned artist. Miss Buckingham is kind enough to invite Wickham to come to her house to see the picture and Wickham is more or less convinced that it really is a Gainsborough. And now slightly odd things start to happen, things that persuade Wickham that he has happened upon something of a mystery. Miss Buckingham suddenly and for no obvious reason gives up her very charming Georgian house and goes to live with Douglas and Una Gaymer. Wickham takes an immediate dislike to the Gaymers. Then Miss Buckingham asks Wickham to sell the painting for her. The transaction that follows arouses Wickham’s suspicions, and these suspicions are further encouraged by something that the old lady’s companion tells him, something that could be construed as having very serious connotations. Wickham is not a detective, he is merely a wine merchant and not even a very good wine merchant. Nonetheless he finds himself drawn into a situation that will force him to play at amateur detective. He is somewhat reluctant to do so but he has not a shred of evidence that he could take to the police, and yet he feels more and more sure that something sinister is going on. And of course what is really going on turns out to be quite different from Wickham’s initial suspicions. Keverne unfolds his plot at a rather leisurely pace. This proves to be a strength rather than a weakness. Mark Wickham is an ordinary sort of fellow, not at all the sort of man who becomes involved in extraordinary events. And at first the situation seems merely odd rather than sinister. Wickham is inclined to believe that there is really nothing very serious going on but his curiosity and a strange feeling of responsibility to Miss Buckingham prompt him to probe a little deeper. And as he does so the situation seems more suspicious although it is no doubt merely a case of an elderly and eccentric old woman being taken advantage of. Certainly it could not possibly involve anything more serious, like murder. Wickham behaves as an ordinary sort of man would behave. He is reluctant to believe that he may have stumbled upon a crime and that the crime might be a very serious one. Wickham might be ordinary but he has a romantic streak in him. He does not like to see innocent people victimised and he is possessed of a certain doggedness that he himself had never suspected. He certainly had never imagined himself cast in the role of hero. He would be infinitely relieved if he could walk into the nearest police station and hand the matter over to someone better versed in such matters than himself, but since he has insufficient evidence to cause the police to ac he pushes on. Having started on the trail he cannot abandon it. While this book can perhaps be regarded as a thriller you’d have to be prepared to accept a very broad definition indeed of thriller. It is most definitely not a thriller of the John Buchan-Sapper-Dornford Yates variety. It is more of a low-key mystery thriller (although much more of a mystery than a thriller) with the emphasis on suspense rather than action and derring-do. Its hero is most certainly not remotely in the Bulldog Drummond mould. Keverne’s style is also much more low-key, in fact closer to the style we associate with the so-called “humdrum” school of detective fiction. That’s not to suggest that Keverne’s writing is in any way dull. He knows how to build suspense gradually but inexorably and his prose is straightforward but pleasing, and he has an ability to sketch in the personalities of minor characters quickly but deftly. This is a story in which we know the identity of the culprits fairly early on but what we don’t know is exactly what it is they’re up to. Their intentions are clearly criminal but we’re not certain exactly what crime or crimes they’re conspiring to commit. 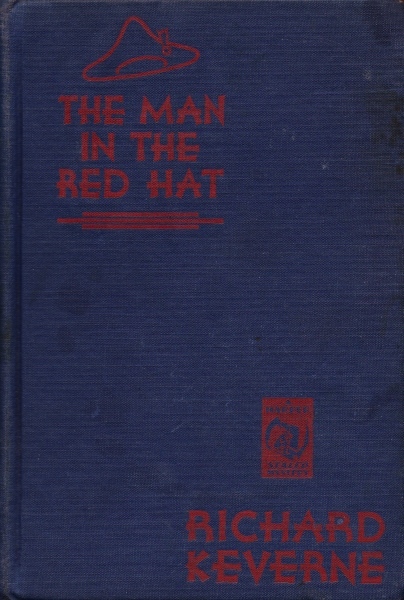 The Man in the Red Hat is an engaging and generally entertaining story and one has to wonder why its author has been so completely forgotten. My judgment is that, as long as you accept that it’s a mystery rather than a thriller, it’s worth a look if you can find a copy. English crime writer Edith Caroline Rivett (1884–1959) wrote under the pseudonyms E. C. R. Lorac and Carol Carnac. 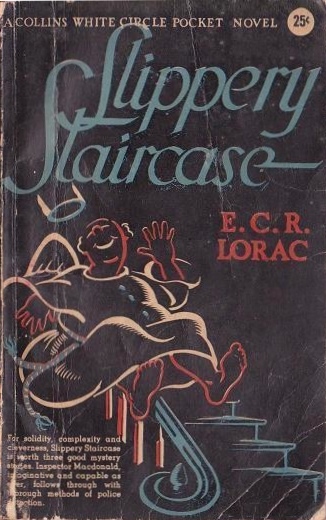 Slippery Staircase appeared in 1938 under the E. C. R. Lorac banner. Martia Vannery, the daughter of a famous artist, owns a large Regency house in London. The house has been divided into a number of flats with Martia retaining the ground floor and studio. While a party is in progress in the studio the body of an elderly woman is discovered at the bottom of the staircase leading to her attic flat. When the police arrive on the scene they find what is apparently a clear-cut case of accidental death. In fact the evidence at the scene appears to make any explanation other than accidental death completely impossible. There’s just one tiny thing bothering Inspector Robarts - the two people who discovered the body gave conflicting evidence about the discovery. This small detail is enough to bring Scotland Yard into the case, and Detective Chief Inspector Macdonald believes that despite the overwhelming evidence in favour of accidental death the case is worth further investigation. Macdonald is a Scot and a very dogged one. He has infinite patience when it comes to unravelling a complicated case and this case is nothing if not complicated. This book is a fine example of two of the major obsessions of golden age detective fiction - apparently unbreakable alibis and apparently impossible crimes. The murder method in this case is exceptionally bizarre and unusual. If all this is not enough Lorac also throws in secret staircases! The breaking of the seemingly air-tight alibis depends on split-second timing. Whether one of the residents of the house arrived home at 3.19pm or 3.20pm becomes an important matter. Macdonald’s unveiling of the murder method involves timing a series of complicated manoeuvres down to the very second. You might think this obsessing over seconds would stretch credibility a little, and you’d have a point. Nonetheless the plot is most certainly ingenious. The suspects are an assortment of fairly interesting characters all of whom seem to have something to hide. Slippery Staircase is an entertaining example of the detective fiction of the golden age and it’s definitely worth a look. Amelia B. Edwards (1831-1892) was a successful writer of both crime stories and ghost stories, although she was to become even better known as a distinguished Egyptologist. She was also an indefatigable traveller, an obsession that furnished her with the backgrounds for so many stories set in various parts of Europe. Her writing was admired by Charles Dickens who published many of her stories in All the Year Round, especially in the special Christmas numbers of that journal which featured stories of ghosts and other mysteries. The stories collected in the Wordsworth volume All Saints’ Eve include stories of both the supernatural and stories of murder and mystery. About half of the stories fit into each of these two categories. Her ghost stories are, sadly, less than impressive. To stand out amid the countless such stories that were published during the 19th century a ghost story needs to have at least one of four things going for it. It has to surprise the reader, it has to have an atmosphere of dread sufficiently strong to produce genuine chills, it has to be terrifying, or it has to create a feeling of the uncanny - of things that are but that should not be. Alas Edwards’ ghost stories fulfill none of these criteria. They are predictable and commonplace and the pay-offs to these stories invariably fall rather flat. She leads us to believe that something truly strange is going to happen and we are inevitably disappointed by the triteness of her endings. These are routine ghost stories, competently written but still no more than routine. Her mysteries are not sufficiently mysterious to be particularly interesting and they lack sufficient suspense to be exciting. The Four-Fifteen Express is one of her most celebrated ghost stories and while it is slightly better than the others included in this volume it still lacks any real impact. Cain is moderately interesting, a story of a painting with an unfortunate history, but again we are left expecting more than the story delivers. A Night on the Borders of the Black Forest has only a very faint suggestion of the supernatural, or perhaps rather we should say the paranormal, and it is one of the few stories that manages to generate some tension. It is also one of the few stories in this collection which actually makes us fear for the safety of the protagonist, and this is perhaps one of the gravest flaws of the other stories - we never feel any real suspense, any sense of menace. It’s a reasonably successful story. A Railway Panic and The Guard-Ship at the Aire are all too typical in that they really don’t go anywhere. There’s perhaps some moderate excitement but there’s really nothing there to compel the reader’s interest. The title story is the most ambitious tale here and it’s possibly the most successful, its advantage being that it has an actual plot that leads somewhere and it has a few twists to keep things interesting. Whether you’re a fan of ghost stories or of mysteries you’re really quite safe to give this collection a miss. Wordsworth have done a splendid job at making the works of many unfairly forgotten writers available to the modern reading public at ludicrously cheap prices. There are many collections from this publisher in their Tales of Mystery and the Supernatural series that are much more worthy of the reader’s attention than this one. On the while, disappointing and not really worth seeking out. 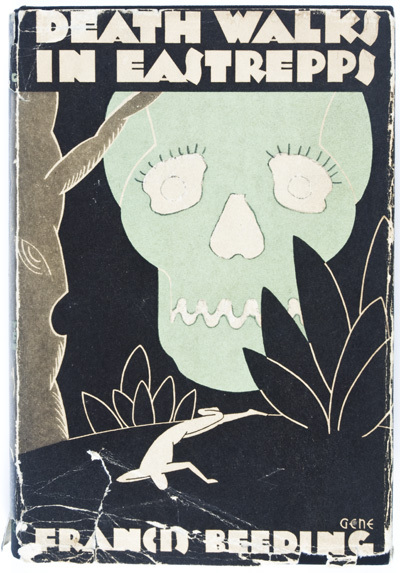 Francis Beeding’s detective novel Death Walks in Eastrepps was published in 1931. At one time it apparently had a huge reputation although it is now almost forgotten. Or at least it was forgotten until Arcturus re-issued it in paperback in their Crime Classics series in 2011). Francis Beeding was the pseudonym used by Hilary Aidan Saint George Saunders (1898-1951) and John Palmer (1885-1944). 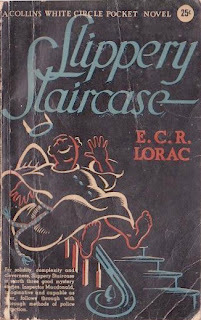 They wrote both thrillers and detective novels under this name, their best-known book being probably The House of Dr. Edwardes which was filmed by Alfred Hitchcock as Spellbound. Death Walks in Eastrepps is a serial killer novel, although the killer does not conform to modern ideas of what motivates such murderers. The murderer could however be described as a psychopath. Eastrepps is a quiet seaside resort town in England. It is always busy in the tourist season but nothing really notable has ever happened there. That is until the Evil arrived. The Evil is the name given by the press to an unknown killer who appears to murder without any comprehensible motive. The first victim is Mary Hewitt, the sister of a retired army officer, Colonel Hewitt. No-one can imagine any plausible motive for the slaying, and when another corpse turns up the case seems even more confusing, there being no obvious link between the two victims even though there is little doubt that they were killed by the same person. At length the local police have to confess themselves baffled and the Chief Constable calls in Scotland Yard. Detective Chief Inspector Wilkins is put in charge of the investigation. The plot also encompasses a fifteen-year-old fraud case, dual identities, an insane nobleman and an unusual murder weapon. Although it deals with what would later be described as a serial killer the structure follows the pattern expected in golden age detective fiction. It adheres to the generally accepted rules that governed the fair-play mystery novel of its era, although it does go rather close to breaking one of the rules. I will not indicate which rule as that would involve a major spoiler. I had a number of issues with this book. Most notably I had reservations about the ending, and about the motive of one of the chief suspects. This is one of those golden age detective tales that includes a lengthy epilogue in which the killer’s methods and motivations are explained in detail. I have no problems with a brief rundown of the killer’s activities that clarifies one or two minor points but I’m always suspicious when the explanations turn out to be lengthy and detailed. It gives me the impression that perhaps the author is not entirely confident that readers will find his plotting and his choice or murderer convincing or plausible. In this particular case I had such concerns the moment the identity of the murderer was revealed and the subsequent lengthy explanations only served to make my concerns more acute. The other problems I had with this novel are largely a matter of personal preference. I have never been particularly fond of serial killer stories and I am a trifle suspicious of crime stories with a body count as high as this boasts. But I emphasise that this is entirely a matter of personal taste and should not be taken as a criticism. This novel also includes a rather protracted courtroom scene. I personally felt it was a little too protracted. Those reservations aside Death Walks in Eastrepps is not entirely lacking in entertainment value, and the plot is certainly ingenious enough. The authors also wrote thrillers under the Francis Beeding pseudonym and I do intend to attempt one of these thrillers. I suspect that their general approach might be more suited to this genre. Sir Nigel, published in 1906, was Sir Arthur Conan Doyle’s prequel to his very successful 1891 historical novel, The White Company. Sir Nigel tells us of the early career of Sir Nigel Loring. Conan Doyle believed that his historical novels represented his best work and as much as I adore Sherlock Holmes I’m inclined to agree with him. In 1349 England had just endured the ravages of the Black Death. Young Nigel Loring is the only son of the celebrated knight Sir Neil Loring. The Loring family has fallen on hard times. Nigel lives with his mother and a handful of servants. A large proportion of the family estates has been lost to the neighbouring Waverley Abbey in a series of disastrous law suits. Not surprisingly Nigel nurses a considerable resentment towards the monks. The conflict between the Abbey and the Loring family takes a strange and fateful turn when Nigel saves the life of one of the Abbey’s servants. As a reward he is given the very horse, an immensely large and powerful horse, that has just gone close to killing the servant. The sacrist of the Abbey, Brother Samuel, believes the horse to be so wild that no man could possible ride it. Nigel Loring, despite his slight stature, is a young man of exceptional spirit and courage. He tames the horse. Nigel now has a horse that would serve as a very fine war horse. Nigel yearns to follow in the footsteps of his distinguished ancestors and to make a name for himself as a brave soldier and a noble knight. Unfortunately, although he has a horse, he has no armour and no money to buy a suit of armour. Without armour he can scarcely hope for an opportunity to join the wars in France and fulfill his ambitions, but fate is about to step in. As an indirect consequence of his quarrel with the Abbey he makes the acquaintance of Sir John Chandos, the most renowned knight in England (who also happens to be a most skillful military leader). Nigel is off to the wars as Sir John’s squire. Nigel is accompanied by the archer Samkin Aylward, an archer of formidable skill who is destined to be a faithful follower and lifelong friend to Nigel. Nigel’s sea journey to France proves to be very eventful indeed, involving the pursuit of a French spy and an encounter with a Spanish fleet. It also offers Nigel the opportunity to perform the first of the three noble deeds in furtherance of his vow. Many further adventures await Nigel in France. The glorious English victory at Crecy in 1346 had by no means diminished the military strength of France and the Hundred Years War had scarcely begun. The adventures of the young squire will find their culmination at the Battle of Poitiers in 1356, the epic victory won by a half-starved and heavily outnumbered English army commanded by Edward, the Black Prince. 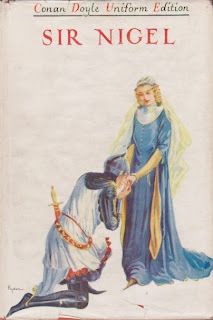 Historical novels of the 19th century had all too often focused entirely on the glory and adventure of medieval warfare whilst ignoring the brutalities and cruelties that were part and parcel of medieval life. The writers of our own day who attempt historical fiction in a medieval setting tend to make the opposite mistake, concentrating on the brutality whilst ignoring the virtues of the medieval period. Conan Doyle struck precisely the right balance. In the pages of this novel you will certainly find brutality and cruelty, but you will also find honour and indeed chivalry. The people of the Middle Ages did not view the world in a way we view it. Medieval warriors were capable of a ruthlessness that shocks modern sensibilities but they were equally capable of acts of quixotic mercy and humanity that seem equally strange when viewed from the vantage point of the 21st century. Conan Doyle was (quite rightly) contemptuous of historical novels that, in his words, draw the 20th century and label it the 14th. Unlike modern practitioners of historical fiction Conan Doyle wanted to capture the spirit of the 14th century. He did not want his medieval Englishmen to behave like contemporary Englishmen. Whether he succeeded in truly making his characters faithful to the reality of the Middle Ages there is no question whatsoever that he succeeded in making them very unlike the people of his own day. There is equally no question of his ability to write magnificently entertaining historical novels. Sir Nigel is absolutely packed to the rafters with action and adventure, and with colourful and immensely fascinating characters. Conan Doyle was one of the greatest writers of historical fiction of his own or any other age. I cannot think of anyone who has excelled him at this art and I consider myself to be reasonably well read in the genre. Sir Nigel is very highly recommended indeed. Herbert Adams (1874-1958) was an English writer of detective stories during the so-called golden age. He was successful enough to have had around fifty titles published but is nowadays all but forgotten. He has fallen into such obscurity that I have been able to find out almost nothing about him. I can’t even find out for certain when this novel was first published. I’ve seen it attributed in different sources to 1935, 1939 and 1940. There’s no reference to contemporary events in the story, something that might have given a clue to the actual date. The Chief Witness is one of a series of novels he wrote featuring amateur detective Roger Bennion and it appears to have been one of his most highly regarded works. It’s certainly based on a very clever idea. Solicitor Alexander Curtis is found in his home, dead from a gunshot wound. As he fell he knocked over and broke a clock. The time at which the clock stopped gives the police the exact time of death - two minutes to eleven at night. Some miles away the body of Alexander Curtis’s brother Frederick is found, also dead from a gunshot wound. As he fell his wristwatch was smashed, thus establishing the exact time of his death - two minutes to eleven on the same night. That’s the sort of coincidence that Roger Bennion is not prepared to accept. The police are at first inclined to suspect suicide in both cases but quickly realise they are dealing with murder in both cases. They are not happy about the coincidence either but they soon find themselves with very strong suspects for both killings. The trouble is that if these suspects are guilty there would seem to be no connection whatsoever between the two crimes. Roger Bennion is absolutely convinced that there must be a very strong connection indeed between the two killings. In fact he is certain that both brothers must have been slain by the same murderer or murderers. That of course raises the question of the apparently simultaneous nature of the murders but Bennion is confident he can find a solution to explain that. What follows is a fairly typical golden age detective story but the gimmick of the two simultaneous murders is clever and it’s cleverly worked out. Roger Bennion isn’t a particularly colourful detective but at least he isn’t irritating. You could say much the same for Adams’ prose - it isn’t fancy but it gets the job done. On the whole The Chief Witness is a rather entertaining read, and it’s a book I can recommend to fans of golden age crime novels. The Avenging Saint (originally published in 1930 as Knight Templar) is one of Leslie Charteris’s early Saint novels. The character was already well-established and Charteris was on a roll by then. Leslie Charteris (1907-1993) was born in Singapore. His mother was English while his father was Chinese. He was brought up and educated in England. He moved to the US in 1932 and later became an American citizen. The Simon Templar of the novels is rather different from any of his incarnations on either the big screen or the small. He is tougher and much more ruthless and has considerable less respect for the law. The very earliest Saint stories certainly imply that Simon Templar had been an out-and-out criminal, albeit one with his own quirky code of morality. If he was going to steal he preferred stealing from other crooks. By 1930 he is established as one of the good guys, but one who prefers to take the law into his own hands, and his kind of justice is somewhat rougher than the kind handed down at the Old Bailey. Charteris’s debt to Sapper’s Bulldog Drummond stories is very obvious in this novel. Like Captain Drummond he has his band of followers although by this time it has been reduced to a single side-kick, Roger Conway. The Saint even has the same rather childish sense of humour as Drummond (this was one of the elements toned down in the TV and movie versions and that is perhaps a good thing). Like Drummond the Saint doesn’t bother with ordinary run-of-the-mill criminals - he likes to go after diabolical criminal masterminds, and fortunately England was apparently awash with such types in the interwar years. In The Avenging Saint there is once again a criminal conspiracy so ambitious that it threatens the very survival of western civilisation. If it succeeds it will plunge Europe and probably the world into war. It’s the kind of conspiracy that the authorities would almost certainly regard with scepticism so Simon and Roger will have to save Europe on their own. Which suits Simon down to the ground, he being the type who would find it impossible to work with any kind of professional law-enforcement agency. As well as saving the world Simon Templar also has to save a millionaire’s daughter who has been caught up in the machinations of the diabolical criminal mastermind Rayt Marius. The Avenging Saint is a sequel to an earlier novel, The Last Hero (which in common with many of the early Saint books was also published under a bewildering array of alternative titles). It shares the same diabolical criminal mastermind, the delightfully evil and unhinged Rayt Marius. In The Last Hero Charteris explains the villain’s plot in considerable detail but in The Avenging Saint he keeps it rather vague. He had presumably realised by this time that whatever the details of the conspiracy it was essentially a McGuffin, serving merely to put in train the series of adventures. It was the action that counted and Charteris supplies that in prodigious quantities, culminating with Simon Templar boarding a train from an aircraft while the aircraft is airborne. The first Saint stories were essentially crime stories but The Last Hero saw Charteris moving into the thriller arena with international intrigue and with much more extravagant plotting and even a hint of science fiction. Most of the Saint stories were short stories or novellas but Charteris has no particular problem coping with the longer format of the novel. 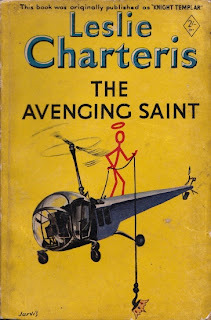 The Avenging Saint displays the Charteris formula to perfection - basically an insanely unlikely romp of a plot done very much tongue-in-cheek and with a great deal of flair. It’s immense fun and is highly recommended. 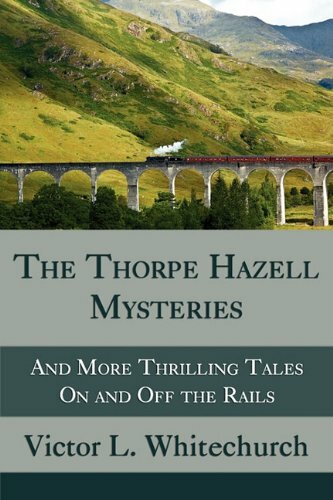 The Thorpe Hazell Mysteries: And More Thrilling Tales On and Off the Rails is a collection of the crime stories of the Rev. Victor L. Whitechurch (1868-1933). Insofar as he is known at all Whitechurch is known for his stories featuring amateur detective Thorpe Hazell. This collection contains all nine Thorpe Hazell stories plus nineteen other assorted crime stories. 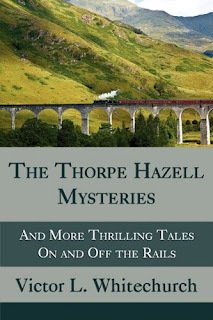 While the Thorpe Hazell stories are unquestionably detective stories the other tales collected here include adventure stories, thrillers and war stories as well as some others than can rightfully be claimed as detective stories. What they all have in common is that they all involve railways. To describe Whitechurch as a train enthusiast would be a colossal understatement. His knowledge of the mysteries of locomotives, railway signaling, timetables and railway matters in general was prodigious. What is even more remarkable is that every story not only involves railways but manages to make some piece of arcane railway lore or some technical detail of railway operations the crucial factor upon which the whole story revolves. Whitechurch was known for his fanatical attention to accuracy, which makes his stories even more fascinating. When he created his best-known character, Thorpe Hazell, his aim was to make him as dissimilar to Sherlock Holmes as he possibly could - an objective in which he succeeded fairly thoroughly. Thorpe Hazell is a quiet self-effacing individual who is not merely a vegetarian - he is a confirmed and spectacular dietary fanatic. He is also prone to engage in extraordinarily bizarre physical exercises at the most surprising moments. While the Thorpe Hazell stories are fascinating I am personally inclined to say that his other railway adventure stories are even more interesting. They are certainly varied. They include wartime railway tales set during the Franco-Prussian War and the Boer War, and numerous stories of international intrigue. Whitechurch gives us momentous diplomatic triumphs made possible only by intimate and intricate knowledge of the workings of the railways. There are even attempted assassinations of more than one very significant historical figure. It is easy to forget that the late nineteenth century was an age in which terrorism was a constant threat. Anarchist bombings were a regular occurrence and anarchists made countless attempts at political assassinations, some of them successful. Attempted anarchist outrages form the centrepiece of a number of the stories in this collection. Although many of these stories are not true detective stories there’s no question that Whitechurch could write very effective stories in this genre when he chose to and some of the stories here have (quite deservedly) found themselves included in anthologies of the best Victorian and Edwardian detective stories. As you might expect Whitechurch’s detectives rely more on their technical knowledge than on leaps of intuition. Despite his eccentricities Thorpe Hazell has a very logical mind when it comes to anything that involves rail travel, and Whitechurch’s other heroes are eminently practical men rather than armchair philosophers or psychologists. Thorpe Hazell has little interest in the motivations of criminals, but he can demonstrate very impressively that some detail of the working of a particular railway makes the guilt of a particular person absolutely certain. If you enjoy Victorian and Edwardian detective stories then you will most definitely want to consider the purchase of this volume. If you happen to have an interest in railways as well this book becomes an absolute must-buy. Coachwhip Publications are to be commended for making the works of yet another wonderful forgotten or almost forgotten crime writer available to us, and in a handsomely presented volume as well. Highly recommended. William Le Queux (1864-1927) was a prolific Anglo-French writer of mysteries and espionage thrillers. Along with E. Phillip Oppenheim he more or less invented the spy thriller genre. Sant of the Secret Service, published in 1918, is one of his later works in the genre. The book is a king of episodic novel, chronicling the adventures of spy hunter Gerry Hunt. Along with his colleague, the beautiful and multi-talented Gabrielle Soyez, he is kept busy dealing with the hordes of German spies who infested Britain and France during the First World War. While there were undoubtedly real German spies operating during this period it is highly unlikely that they existed in anything like the numbers conjured up by Le Queux’s vivid imagination. Le Queux’s style was lurid and sensationalistic to an extreme degree. The modern view is that his stories are dated and slow-moving. Perhaps, but they have charms of their own, conjuring up a vanished world. 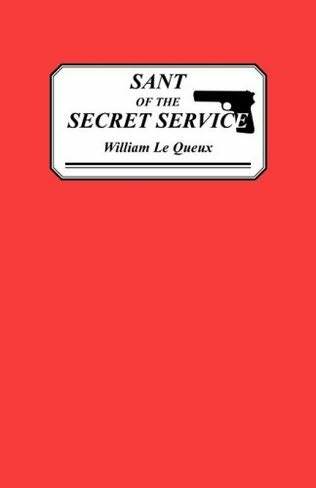 There’s less action than a modern reader would expect in a spy thriller but Le Queux does his best to create an atmosphere of breathless excitement. Le Queux’s approach is very much of the Edwardian period and he never bothered to alter it. To him espionage was a game for gentlemen. Even in 1918 he would have appeared to possess the prejudices of an earlier era. In keeping with his Edwardian approach he relies a good deal on having his characters, especially Gabrielle Soyez, adopt disguises. 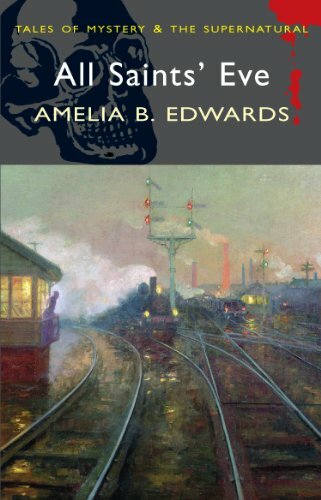 This was a standard feature of thrillers and mysteries of the Victorian and Edwardian periods an by the time this book appeared it was already an old-fashioned technique. I don’t think being considered old-fashioned would ever have bothered Le Queux. This is the spy thriller as melodrama and the plotting is somewhat clunky. There’s not much to the characterisations. Le Queux’s heroes were heroic and his villains villainous and it goes without saying that the heroes are French and English and the villains are German. The idea that German espionage agents might have seen themselves as loyal and patriotic servants of their country is not one that you will this author exploring. Gabrielle Soyez must qualify as one of the earliest female master spies in literature and she’s portrayed as being more than just an attractive assistant to the hero. She is a heroic and capable figure in her own right. Whatever his faults Le Queux was a major figure in the development of the spy thriller and if you claim to be a fan of that genre you need to read at least one of his books (and at least one of Oppenheim’s). Their works would by the 1920s be displaced by the far superior and more realistic and sophisticated espionage tales of John Buchan and Somerset Maugham but they had served their purpose, creating a readership for the genre that has not yet shown any signs of disappearing. Sant of the Secret Service is fun in its own way and can be recommended to readers who are prepared to judge it by the standards of its own time. Cecil John Charles Street (1884-1965) wrote no less than 140 books, most of them detective novels, under a variety of pseudonyms. 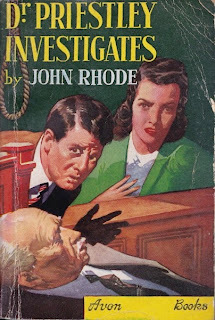 This impressive output included dozens of Dr Priestley mysteries, all written under the name John Rhode. For the sake of convenience I will refer to the author by this name. Dr. Priestley Investigates (this is the US title of a book originally published in the UK as Pinehurst) was one of his earlier efforts, appearing in 1930. This novel starts with an apparent crime that turns out to be very different from that suggested by initial appearances. A drunk driver is pulled up and in the dickey seat of his car is found a body with a rug draped over it. Superintendent King of the Lenhaven Police believes he has found a satisfactory explanation for this odd occurrence and the case appears to be closed. That is, until Dr Priestley takes a hand. A serious crime has certainly been committed but it is merely the culmination of a series of criminal acts stretching back over nearly a decade, crimes which even include piracy! The ingredients are certainly there for a lively and engaging tale and that’s more or less what we get. Rhode was one of the writers dismissed by critic Julian Symons as the Humdrum School. That’s a little unfair but it has to be admitted that Dr Priestley (in this novel at least) is a remarkably colourless detective. In fact the most interesting character in this tale is the dead man the discovery of whose body starts the initial investigation. Rhode might be a little weak in the area of characterisation but he could certainly construct the kind of intricate plot that readers of that era demanded. The plot is both complex and colourful. Much of the action takes place in a very unusual setting - a beached yacht. Dr Priestley relies more on purely intellectual deduction than on physical clues although there are a couple of such clues that do prove to be important. And Rhode is, when the occasion demands, prepared to have a detective crawl about on his hands and knees examining tyre prints (although in his case the procedure is carried out by a secondary investigator, Chief Inspector Hanslet). Mention of Chief Inspector Hanslet brings up an interesting feature of the book. It does not quite follow the familiar pattern of having an amateur detective single-handedly solving the case while official police detectives flounder about uselessly. Both Superintendent King and Chief Inspector Hanslet play important roles in unravelling the mystery. In that respect the book combines features of the police procedural with the more common (at the time the book was published) amateur detective story. Rhode rather neatly manages to have the best of both worlds - his official police detectives have the advantage of being able to call on the vast resources of the police force while his unofficial detective has the advantages of freedom of action and time for purely intellectual reflection. Rhode gives us rather more action that we would normally expect in this style of detective story. There are no less than three gun battles, not to mention piracy on the high seas. At times the reader could be forgiven for thinking that he’s picked up a thriller by mistake. The only real flaw I can find in this tale is that the main detective, Dr Priestley, could have been made a bit more memorable and distinctive. It may well be that the author has deliberately made him somewhat on the bland side, a practice that was not uncommon at the time and represented a reaction against the Sherlock Holmes type of colourful and eccentric sleuth, a type that often ended up dominating the story at the expense of the plot (it’s worth remembering that the careers of Conan Doyle and John Rhode overlapped). Dr. Priestley Investigates is an entertaining novel that demonstrates that the writers of the “Humdrum School” were often far from humdrum. Recommended. 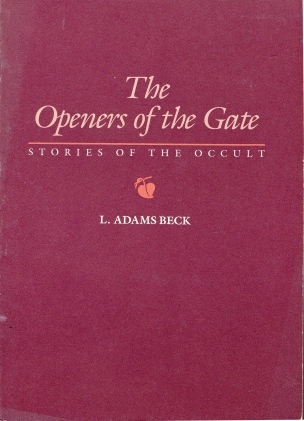 L. Adams Beck’s 1930 short story collection The Openers of the Gate is subtitled Stories of the Occult. That’s certainly a fairly accurate description as far as it goes but it is likely to create an impression that these are horror stories. Some of them can almost be considered as horror tales but the author’s purposes are rather different from those of the average horror writer. 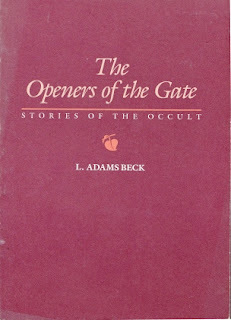 She makes it quite clear in the preface that she takes these things very seriously indeed, that in fact the occult is to her very much a reality and that she intended these stories to convey real Spiritual Truths. I offer this review as a warning to others who might repeat my mistake of buying this book under the impression they were buying a collection of gothic or horror tales. The first thing to be noted about this volume is that it is not a collection of occult or psychic detective stories even though it has (for some obscure reason) been given that label and at least one of the stories has appeared in an anthology of occult detective stories. A few of the stories do superficially resemble the occult detective story. The stories vary wildly in quality. Some are much too sentimental while others betray an embarrassingly naïve belief in what used to be described as mumbo-jumbo. Others still contain exceptionally interesting ideas and some contain moments that can genuinely be described as uncanny or even horrific. Some of these tales are set in England while others take place in various parts of Asia, most of which Beck would have visited during her extensive travels. Elizabeth Louisa Moresby (1862-1931), the daughter of an admiral, wrote under various pseudonyms, L. Adams Beck being evidently one she used frequently. In addition to her fiction she wrote books on various esoteric and spiritual subjects and was a devotee of Theosophy. That sort of thing was intellectually much more respectable in the 1920s (when the stories in this collection were written) than it is today. She was one of those Europeans who convinced themselves that wisdom was something only to be found in the Mysterious East and that in Asia everyone was immensely spiritual. It’s a belief that became very tedious indeed in the 1960s but even in the 1920s most people would have (quite reasonably) found such an idea annoying to say the least. The title story is one of several so drenched in sentimentality and wishful thinking that the reader requires a very strong stomach to finish them. How Felicity Came Home is another egregious example of this tendency. Both stories illustrate the author’s obsession with the spiritual nature of animals. Lord Killary displays the author’s combination of severe morality coupled with syrupy sentimentality. Waste Manor and The Mystery of Iniquity are much stronger and can be read at least in part as very effective and unusual horror. The Mystery of Iniquity even includes an example of what would today be described as a mind vampire. This story starts off extremely well and builds a nice atmosphere of weirdness and horror only to fall apart at the end when once again the spirituality of the East solves all problems. Many Waters Cannot Quench Love takes place on a remote tea plantation in Ceylon (as it was then known). It’s one of Beck’s more interesting stories, a tale of a half-English woman and a drunken planter. It’s one of several tales in this volume that can be approached as offbeat ghost stories. In The Horoscope an English landed gentleman rejects his own culture in favour of Indian culture, which is of course incredibly spiritual and full of wisdom while European culture is wicked and barbaric. If that sounds to you like a story that will turn out to be a load of irritating drivel then your judgment is spot on. The Thug is rather intriguing, being one of several of Beck’s tales dealing with past lives. That would normally be enough to put me off completely but it’s actually one of her better efforts and it’s worth persisting with. An Englishman discovers that he is actually a member of the Thuggee cult. The Thugs turn out to be murderous thieves but of course (like every single person in Asia) they’re very spiritual. The story is rather better than it sounds. Then we get to Hell, a remarkably creepy and unconventional ghost story that would be a very fine story indeed if Beck could have restrained herself from her customary metaphysical silliness. The last tale is The Man Who Saw, a tale of the wisdom of the East that is truly one of the most excruciatingly bad and embarrassingly silly stories it has ever been my misfortune to encounter. Overall a mixed bunch with a few unexpected highlights but unless you share the author’s belief that everyone in Asia is wise and spiritual while every European is stupid and barbaric or you hare her enthusiasm for Theosophy you will find this collection very very difficult to struggle through. 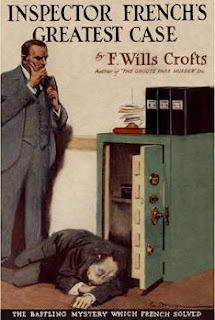 Freeman Wills Crofts (1879-1957) was one of the most notable British (actually Irish in this case) writers of the golden age of detective fiction. 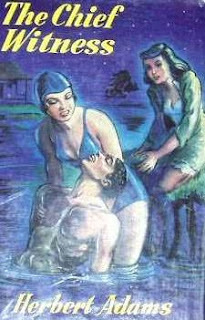 Inspector French's Greatest Case, originally published in 1924 (or 1925 according to some sources) was a fairly early work although by this time Crofts’ reputation was already well established. Inspector French was the best known of Crofts’ fictional detectives. At first it seems like a relatively simple case. The head clerk of a diamond merchants’ is found dead in the firm’s office. He has been killed by a blow from a blunt instrument. The safe is open and has been robbed of £33,000 worth of diamonds plus about £1,000 in cash. The murder weapon is quickly discovered. The local detective-superintendent calls in Scotland Yard and Inspector French is put in charge of the case. He anticipates few problems. The inspector’s optimism proves to be ill-founded. There is no shortage of clues but frustratingly every single line of investigation starts promisingly but eventually ends in a blind alley. The investigation will lead Inspector French to Switzerland, the Netherlands and France and finally to a steamship bound for Brazil. After weeks of painstaking work the inspector not only finds himself with insufficient evidence to make an arrest, he also has to admit to himself that he still has no idea of the identity of the criminal. There are a number of suspects but in every case there is some baffling break in the chain of evidence that makes their guilt seem unlikely. Inspector French is not the kind of detective who relies on sudden leaps of inspiration. He might not be brilliant but he is dogged and methodical. He is very much a professional. He knows that the work of a detective is one percent inspiration and ninety-nine percent perspiration. That does not worry him. He has an orderly mind. He enjoys hard work and he thrives on details. Nothing is too trivial to be investigated. If all the most obviously promising lines of investigation fail to produce a result then he will turn to the less promising ones and he will pursue them with the same thoroughness. One thing that soon becomes obvious to the reader is that the criminal in this case must have a mind not dissimilar to French’s. This is a criminal plot that has been carried out with a methodical attention to detail. But French knows that no matter how clever a criminal might be he will still leave some traces of his activities. £33,000 worth of diamonds might be nice to have but it’s not really useful. Diamonds can be traced just as bank notes can be traced. At some point the criminal will have to try to convert those diamonds into currency that cannot be traced, and he cannot do that without leaving a trail. French knows that if he can match the thoroughness and patience of this criminal he must eventually prevail. This attention to detail might sound as if it has the potential to become dull. It’s to the author’s credit that this book is never in danger of that fate. French’s patient stalking of the criminal is always fascinating. This book is in many ways a precursor of the “police procedural” sub-genre of crime fiction, and Crofts shows himself to be a master of this type of story. That the book always remains interesting is due in part to the character of Inspector Joseph French. He might not be a colourful detective but he’s a character we grow to like more and more. He has his foibles but in general he’s a very decent and rather kindly man. He never forgets that a policeman’s job is all about people. When a witness starts telling a boring and interminable story about his own problems in life it’s part of the job of a policeman to listen. French knows that this will always pay dividends. That witness will then be more disposed to put himself out a little in order to help the police and will often volunteer more information than he would otherwise have done (information which may turn out to be vital). The chief advantage of a police detective as compared to an amateur is that he has vast resources on which he can call. He has not just one pair of eyes but dozens of eyes all on the lookout for information, and some of the most crucial clues in this particular case are discovered by ordinary police constables just doing their job. And Inspector French knows how important it is to make the most humble constable know that his efforts are appreciated. This is yet another way in which French’s basic decency makes him a more efficient policeman, and also makes him a character we empathise with. We desperately want him to succeed in solving the crime because we feel he deserves success. He has earned it. The reader will undoubtedly come to the conclusion that the author has also earned his success. This is a supremely well-crafted and thoroughly enjoyable mystery by one of the masters of the genre. Highly recommended. Having read all of P. G. Wodehouse’s Jeeves and Wooster short stories I’ve now moved on to the novels. 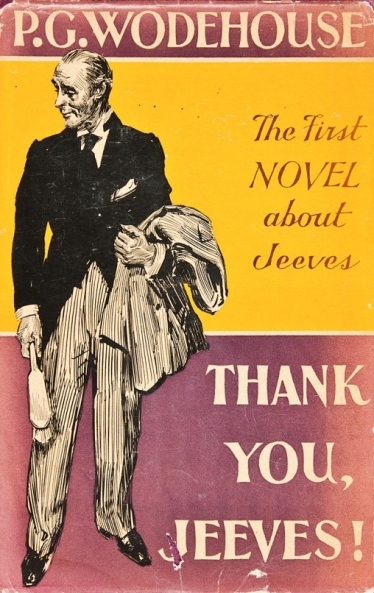 And if Thank You, Jeeves (the first of the Jeeves and Wooster novels which appeared in 1934) is anything to go by they’re just as delightful. This book opens with the unthinkable happening - Jeeves gives notice. He can cope with the never-ending disasters in which Bertie Wooster gets himself embroiled but Bertie’s playing of the banjolele is more than he can endure. Bertie’s neighbours seem inclined to agree with Jeeves and he is forced to move. He takes a cottage in the country, a cottage owned by his pal Chuffy (actually the fifth Baron Chuffnell). To his dismay he once again crosses paths with the dreaded Sir Roderick Glossop, the eminent psychiatrist who is convinced that Bertie needs to be institutionalised for his own protection. There are other hazards to be encountered at Chuffnell Hall. There’s Chuffy’s appalling nephew Seabury for one, and there’s American heiress Pauline Stoker to whom Bertie was once engaged. He considers his avoidance of that marriage to be one of the luckiest escapes of his life. Pauline and Chuffy are madly in love but the course of true love certainly does not run at all smoothly. Luckily for them, or possibly unluckily for them, Bertie is determined to help matters along. This eventually leads to his kidnapping by Pauline’s terrifying father. Despite having given notice Jeeves naturally plays a key role in the story. Which is just as well as Bertie’s new man, Brinkley, proves to be a very dangerous and indeed homicidal lunatic. Bertie also finds himself once again in danger of getting married, and also finds himself persecuted by the local constabulary (who seem to share Sir Roderick Glossop’s views on Bertie’s sanity). Jeeves has his work cut out for him this time as Bertie gets into one scrape after another. It’s all glorious fun. Wodehouse has no difficulty sustaining his blend of delightful humour over a full-length novel, and in fact the novel format allows him to involve Bertie in even more intricate escapades. There may have been other writers equally as funny as Wodehouse (Evelyn Waugh in his pre-war novels being one) but I don’t think there’s ever been anyone who could better him. Wodehouse is uninterested in doing anything but entertain and he succeeds gloriously. Highly recommended. Arthur A. Nelson’s 1915 novel Wings of Danger is another of those lost world stories that I love so much. This time it’s Vikings in Africa. What’s not to love about that? The narrator is Alan Severn, a gentleman adventurer in Africa. He is recalling events that, on internal evidence, happened in the early 1890s. Alan Severn and his cousin Sheridan Severn have invested all their money in a gold mine in southern Africa. They have reluctantly been forced to the conclusion that the mine cannot be made to pay without the investment of sums that they cannot possibly raise. They are facing ruin until, rather surprisingly, a man offers to buy the mine for £5,000. The man is none other than Cecil Rhodes. Rhodes has come up with another of his plans to spread British power in Africa. He wants to use Alan Severn as his instrument. The idea is to create a situation that will force the British government to annex a new territory. The problem is that another power has similar ideas. They intend to use Leopold, the King of the Belgians, as their instrument. Leopold will declare a Protectorate over this territory but in reality the territory will end up under the control of the German Empire. To carry out Rhodes’ plan the Severn cousins set out on a trek to previously unexplored regions of Africa. They soon encounter their rival, a charming and insanely brave Frenchman named Raoul de Roquemort. The Frenchman saves Alan’s life and the two expeditions join forces although neither Severn nor de Roquemort have abandoned their plans. Alan Severn has a faithful servant named Ingulf. Ingulf’s origins are obscure. He won’t reveal anything about them and he does not appear to belong to any known African tribe. In fact his racial identity is quite uncertain. Raoul de Roquemort’s party includes a scientist named Dr Eric Ivarrson (with whom Severn has already become acquainted). Ivarrson has a theory that seems incredible - that Vikings not only reached southern Africa but actually established a kingdom there. He suspects that Ingulf will turn out to be proof of his theory. Needless to say there is also a love interest. Alan Severn is in love with Norma Raylescroft. Her father is immensely wealthy and will countenance the possibility of his daughter’s marrying a possible fortune hunter. If Alan wishes to marry her he will first have to make his own fortune. The combined Severn-de Roquemort expedition encounters numerous obstacles and dangers, not the least of which is an attack by an entire Matabele impi. Our adventures are outnumbered by at least fifteen to one but luckily de Roquemort had thought to bring along two Maxim guns. No matter how brave the Matabele might be they cannot stand against machine-guns. The expedition eventually discovers a chain of extinct volcanoes. Within the gigantic craters of these volcanoes is a lost world. A Viking world. Most of the inhabitants are Africans or mostly African but some clearly have not only European blood but unmistakably Nordic blood. Their names are corrupted versions of Norse names. And culturally they are more or less pure Viking. Considering the racial concerns that were so prominent at this period of history it’s interesting that Nelson clearly believes that culture is far more significant than race. Whatever their ethnicity might be the inhabitants of this lost world think and behave like Vikings. The discovery of this hidden civilisation and of the Viking capital of Valkyria are astounding enough but the adventures of Alan Severn and his companions are far from over. This book was originally published in serial form in Adventure magazine in 1915. It has all the action and all the thrills, combined with the romance, that the readers of that magazine would have expected. It has more than action however. However outlandish the central idea might be it is obvious that the author had put considerable thought into the matter, and had done at least some research on Norse sagas and Viking history. The characters are more or less standard adventure characters although de Roquemort at least is a little more complex than one might anticipate. The African-Viking characters are neither bloodthirsty savages nor idealised noble savages. Some are vicious while others are brave and noble. 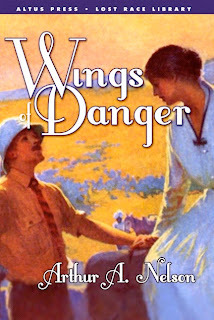 Wings of Danger is a very satisfying mix of adventure, romance and intrigue. Plus it has Vikings in Africa. That should be enough to satisfy anyone. Highly recommended.